NEW YORK, Feb. 1 (Xinhua) -- The top of the landmark Empire State Building here in Manhattan will shine in red, blue and yellow on the nights of Monday and Tuesday to celebrate the Chinese Lunar New Year, which falls on Tuesday. 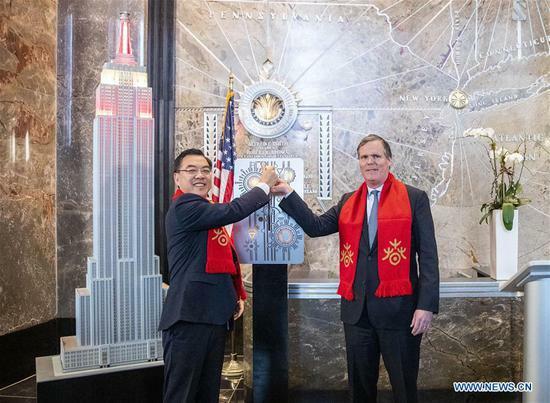 Chinese Consul General in New York Huang Ping, together with John B. Kessler, president of the Empire State Realty Trust Inc., flipped the switch to light a model of the building on Friday in the lobby of the building. Huang said that the Empire State Building's lighting of Lunar New Year serves as a symbol of the friendship between the peoples of the United States and China. "Last year, more than 1.1 million Chinese tourists visited New York City, and the Empire State Building is one of the 'must-see' icons for all of them," he said. 2019 is the Year of the Pig according to the Chinese zodiac. 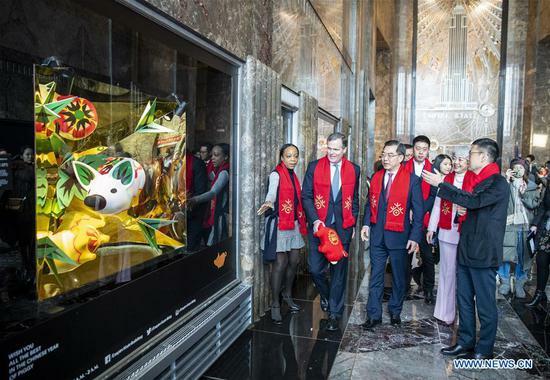 A window display featuring pigs designed by China Arts and Entertainment Group has also been installed in the building's lobby windows on the Fifth Avenue. It highlights pigs in traditional Chinese craftwork, including clay sculpture, papercutting, sugar-figure blowing and lanterns. 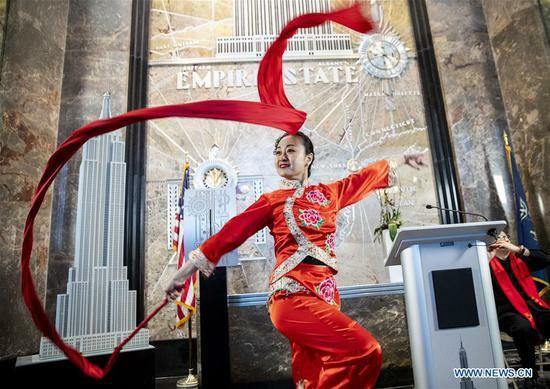 The lights and the window display demonstrated that the Empire State Building "encourages more people, including native New Yorkers to experience a bit of beauty of the Chinese traditional cultural festival," said Huang. Soaring 1,454 feet (443 meters) above Midtown Manhattan, the Empire State Building has maintained a tradition of changing color to recognize various occasions and organizations since 1976. It is for the 19th consecutive years that the landmark of Manhattan shines in honor of the Chinese New Year, which is a public holiday in the state of New York.